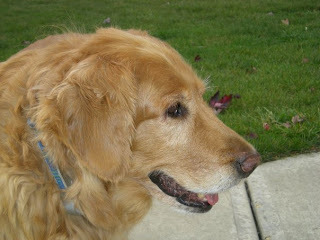 A few night's ago, I found out that some very dear friends of mine were going to have to put their dog Sadie to sleep. When I got off the phone with their daughter Kelsey, I cried my eyes out in David's arms. It was so strange to have such an emotional reaction to a dog that wasn't even mine. 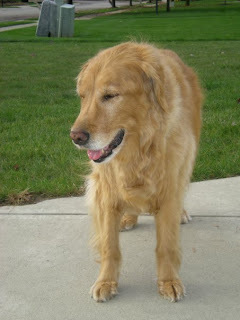 But, Sadie was an incredibly special dog. My first year of teaching in Indianapolis, I shared a room with Diann Oberlin. I was teaching in a somewhat different position than my previous job in Columbus. Even though I was still teaching special education, the difference in the types of students was incredible. Diann was (and still is) an amazing teacher who used so many different methods to reach the students that we worked with. Sadie was one of those methods. Diann would bring Sadie into our classroom about once a month. She was the most calm dog to be around. Some of our students had never been around dogs -- something that struck me as a little odd coming from the small town of Columbus. One of our students, Kenyon, was particularly scared of Sadie. He would wince and grimace the second he saw that she was in the room. But, after a few visits from Sadie (and some licks and wags of her tail), there was not one student in the whole building who was afraid of her. And, there definitely was not one student there who didn't love her to pieces. Diann would usually try to let me know if she was going to bring Sadie in to school, but sometimes it was a surprise. And, one of two things would usually have happened that morning before work. I would have either chosen to wear a skirt and have legs covered in lotion or would be wearing all black. Normally, a dog licking the lotion off my legs or shedding their thick blonde locks all over my clothes would not make me a happy camper at 7:00 in the morning, but it was Sadie. It was NEVER a bother. Whenever the Oberlins would go on vacations, I was asked to stay at their home and watch Sadie. This was always a welcome request. One, because it was nice to get out of the small apartment I lived in, but, mostly it was because it was so great to lay and snuggle with Sadie. She always seemed to know if I was having a bad day because she would stay by my side or snuggle even longer than usual. Even though the Oberlins have two (sorry) very annoying cats, I would have moved in for a month to stay and take care of her. Sadie was mostly an outside dog. She loved nothing more than to lay in her front yard or driveway and watch the day unfold. During the summers, it was always difficult to drag Sadie in for the evening. She also loved hunting squirrels - especially the ones who would tease and torment her. Cars...gutters...nothing could stand in the way of Sadie getting a squirrel. My favorite memories of Sadie would definitely be the numerous times of pulling into the Oberlin's house to share a glass (er...a bottle) of wine with Diann and have Sadie eagerly greet me in the driveway. It automatically put a smile on my face. I know this last week has been hard on Mike, Diann and Kelsey. Saying goodbye to someone we love is never easy. I guess we just have to rest assured that Sadie is now up in Doggy Heaven watching our days unfold. Where's the closest Cheeseburger in Paradise?? It's all good in the uterus hood!